Our adventures into this theme tutorial for WordPress is working out great so far. 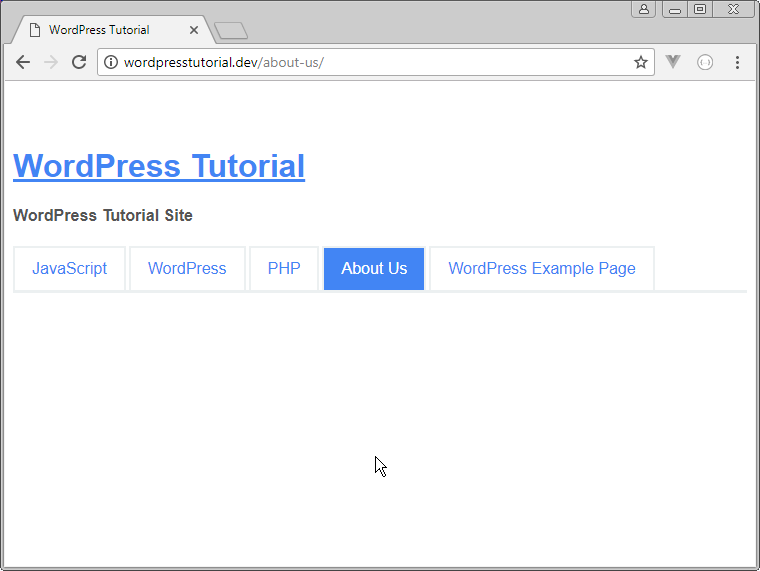 Of course our current theme is a very basic example of what you can do when creating a WordPress theme from scratch. As we know, it is the index.php file that is handling most of the heavy lifting with regard to html generation on our posts and pages at this time. Wouldn’t it be nice if we had a way to change up the look of our pages in WordPress so as to easily differentiate them from normal posts in our theme? It turns out there is in fact an easy was to do this, and we do so by making use of the page.php file in our theme. Let’s examine how to work with this file in this tutorial. What are pages for in WordPress? By default WordPress allows you to post content to your website in the form of either a post or a page. They are similar but different. What sets them apart is that a page in WordPress is a way to publish content that is not part of the normal blog stream so to speak. When you publish a page, it does not appear at the top of your site as the first entry like a normal blog post would. Pages are often used for content such as an “About Us” page, or a “Contact Us” page. Our current theme does not yet have a page.php file, yet we can still view the example pages in our browser. How does this happen? This is interesting. We are clearly able to visit a couple of example pages in our site, but there is not yet a page.php file. It turns out, the page.php file is not mandatory to create a basic theme. If this file is not present, your pages will simply use the index.php file to render output to the browser. The page.php file comes into play when you want to customize the look and layout of pages on your WordPress site. If the page.php file is present, WordPress will use the code in that file instead of index.php to render the page. Go ahead and now create a new file in your theme folder named page.php. With this file in place, WordPress will no longer use index.php to render a page, but page.php. Think of page.php as a way to override the default output of index.php. So with our page.php now created, we can add some code to that file to control how it displays pages. We can start by simply including the get_header() function, as any post or page is going to need this. We’ll then test this out. This is pretty cool! We can really get an idea of what that get_header() function is doing for us here. The content of the page is not displayed however that call to get_header() outputs all of the information we have included in header.php such as the site name, tagline, and of course the navigation menu that we have been building. So what have we changed? Well, it’s pretty simple really. We removed the link from the title of the page. In addition to that, we assigned a special class name to the article of page-layout. That means we can now target content from pages differently than we would for posts. 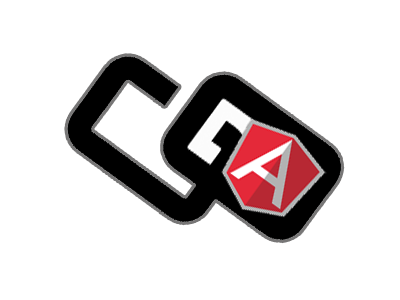 So let’s go ahead and add some styling to our style.css file so that our page looks a bit different than our posts. Voila! We can see the pages now have no link for the title text, in addition to that text being larger. So what we are doing here is setting up some conditional logic for WordPress to act on based on whether a test is true or false. The is_page() function is going to return true if we are making a query to a specific page. If that is the case, the message of Thanks for visiting our page! will appear. If we are visiting a post or category however, that message should not appear. Let’s try it out here. Now it looks like this is working perfectly! There might be times when conditional logic is not the best choice for customizing your page. What if you want an entirely different layout for a specific page, but only for one specific page. You don’t want these radical changes to apply to all pages in your site, just one. You can do that by creating a new file with the format of page-slug-of-page.php. So for example, let’s imagine we want a whole new layout just for the “About Us” page. 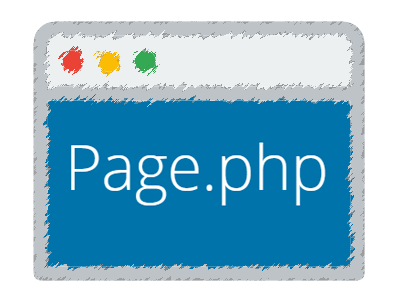 We can create a new file in our theme named page-about-us.php. We will change the layout to make use of a table for our content. We’ll place the title on the left of the page, and the content on the right by making use of tables. Let’s try it out. Now, the only page in the entire site that will make use of this file is the page with a slug of ‘about-us’. Pretty slick! We can see that the About Us page is now making use of a two column layout of sorts by way of that table. We’ve seen quite a few ways to customize the look of a page or set of pages in WordPress. 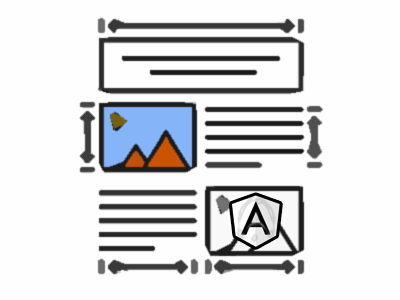 Lo and Behold, we have yet more ways to customize our pages by way of custom page templates. Let’s see how we might do this. Go ahead and create a file named page-template.php. In that file, we can place the following markup. Now check this out. If you visit your WordPress Dashboard, click on Pages, then click on ‘Edit’ for one of the pages, you will notice that there is a new field under the Page Attributes area or the editor. 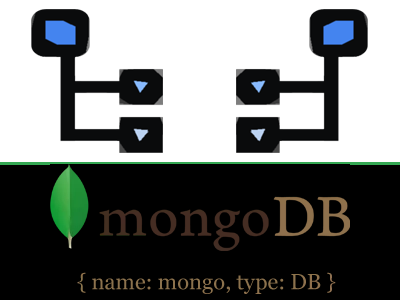 We now have the option to choose which template to apply to this particular page. 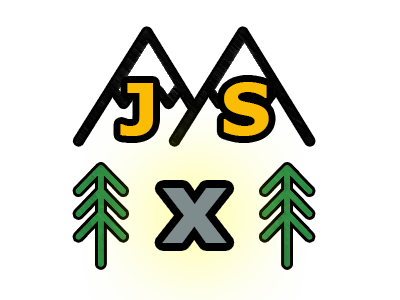 WordPress is able to detect this new template file because we gave the file a suffix of ‘template’ and we set a special property in the comments of that file. 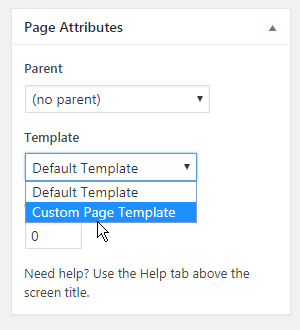 In the comments we added “Template Name: Custom Page Template” so now in the editor, we have the choice of making use of the Custom Page Template from the dropdown menu. Very cool! 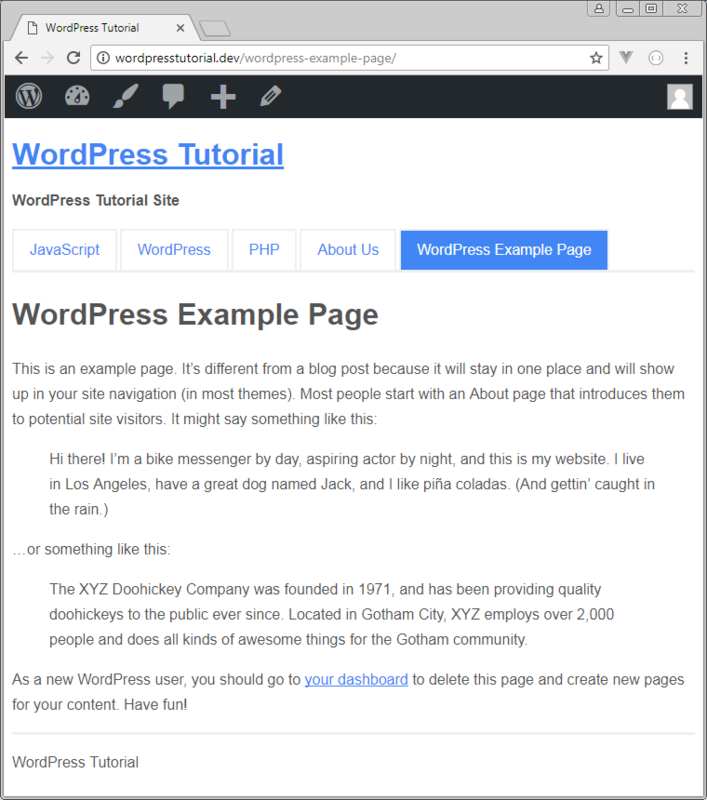 Let us now go into the WordPress Dashboard and edit the “WordPress Example Page” page we have in our site. We will select the Custom Page Template that we have now created and click update. When we visit our page, we can see the custom page template has indeed been applied. What is great about this, is that we can apply this template to any page we like and at any time. It is a very flexible way to alter the layout of various pages as you see fit. In this tutorial we had a look at several different ways you can apply custom layouts and formatting to your pages in WordPress. First off, we looked at how to use conditional logic via is_page() to determine if we were on a particular page and then run special code for that page. Next up, we saw how you can create a template file with a matching slug or page id to apply a file to a specific page. 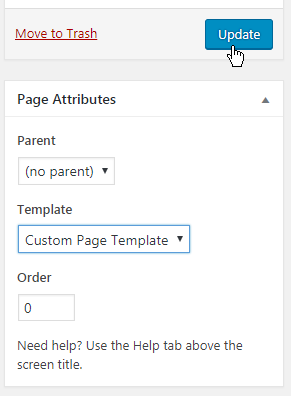 Lastly we had a look at how to define custom page templates which could then be selected from the WordPress editor to apply to any post you like.